The Mig 21 Clear Fusion Vape Pen Kit is arguably one of the best deals around. This kit comes with two batteries, three tanks, a 30ml bottle of vape juice and a very handy carrying case that stores everything safely and securely. For couples wishing to quit smoking, buying this one kit can get them both vaping full time with a tank to spare. A 12% discount coupon at the bottom of this review only sweetens the deal. The Mig 21 with the metal rainbow battery. The Mig 21 vape pen is nothing new. It has actually been in production since 2014. 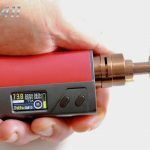 Unlike other vape pens and mods that are all the rage one month and quickly replaced and forgotten a few months later, the Mig 21 has been a constant. The reason is simple; it’s easy to use and does its job well. The Mig 21 is one of the most best above ohm vape pens. 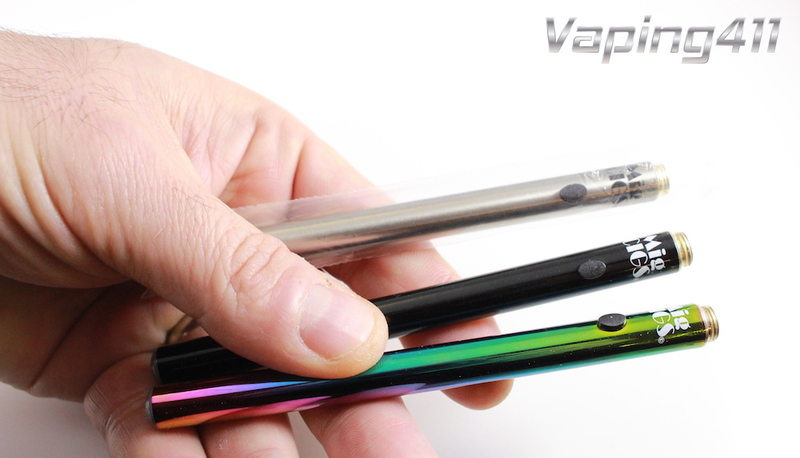 It easily out performs newer vape pens such as the KangerTech Top EVOD. Because it’s an above ohm device, it requires the mouth to lung (MTL) vaping technique. This style of vaping is similar to how one would inhale cigarette smoke, making it an easy transition for smokers who switch to vaping. It also has a sleek, pen like design and not boxy or awkward to carry. There are an assortment of battery colors for the Mig 21, as well as automatic of manual batteries. The Mig 21 Clear Fusion Vape Kit comes with your choice of two batteries. Each of the batteries measure 140mm long and rated at 380 mAh and 4.2v. Unlike other batteries that gradually emit less voltage as they become depleted, these batteries have an integrated circuit that provides a steady 4.2 volts until drained. There is the option to get automatic batteries, which provide a voltage whenever a vaper takes a hit, or manual batteries that are push button activated. There is also a choice in colors such as pink, white, black, stainless steel and the flashy metal rainbow. These batteries are long lasting and will go all day, even for the most serious vaper. The Clear Fusion and Clear Fusion Max are top fill tanks and leak proof. The Mig 21 Clear Fusion Kit has two tank options available, the Clear Fusion Vape Tank and the Clear Fusion MAX Vape Tank. The MAX tank uses 1.8 ohm atomizers while the regular Fusion tank uses 2.5 ohm atomizers. The MAX tank is recommended for vapers wanting more vapor production. For vapers more interested in flavor, the regular Fusion tank is the best choice. Both styles have a convenient top fill design that will not leak. 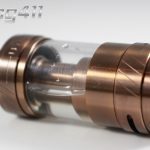 The clear tank tubes also have a milliliter gauge reading stamped on the tube so vapers can clearly see how much juice is left in the tank. Although these tanks only hold 1.3ml of vape juice, the e Liquid tends to go a long way. A moderate vapor can go most of an 8 hour work day without needing to top it off again. The clear benefit of switching from a cig-a-like to the Mig 21 is gaining the ability to choose which ejuice to vape. Most cig-a-likes come with pre-filled cartridges. If the flavor is awful, there is very little that can be done about it. Clear Fusion tanks are refillable and can be used to vape any favorite vape juice. The fusion carrying case holds everything needed for those weekend getaways. The Mig Cigs Ego style carrying case is included with the Vape Kit and available in three colors: Black, Cherry or White. 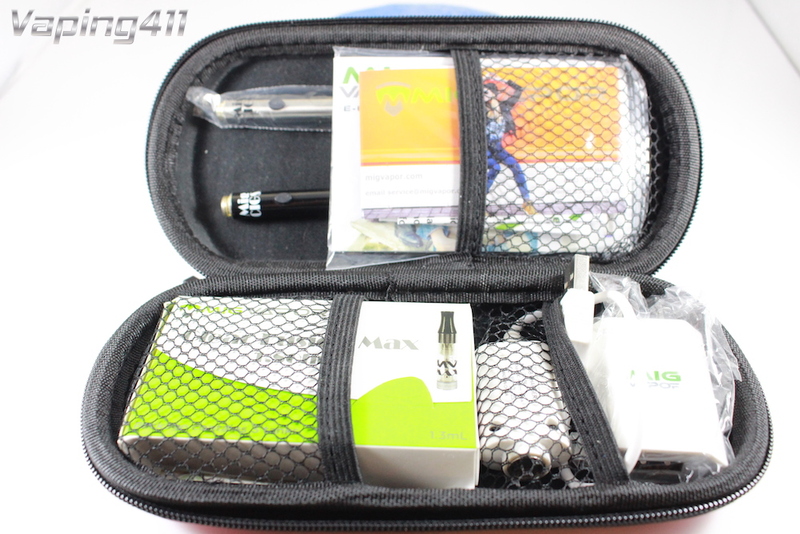 The carrying case is designed to hold everything that comes with the Mig 21 Clear Fusion Vape Pen Kit with the exception of the vape juice. It’s a durable construction and has a hassle free zipper than can be easily opened and closed. It’s a well padded case and protects the vape kit from any accidental damage. The best thing about this case is that it’s perfect for traveling and stores all the essential items in one place. This Mig 21 Clear Fusion 12% discount is applied automatically when you click the orange "Activate" button on right. The Mig 21 has been a top seller for Mig Vapor for almost three years. The reason is because it's a proven winner. The Mig 21 is praised by vapers for its simplicity and solid construction.